March 26th, 1991 and spring was in the air. As it was a local election day with people off work and schools closed, children took advantage to play which 20 years ago entailed going to parks or the mountains; today it would be PC rooms or on computers in the home. 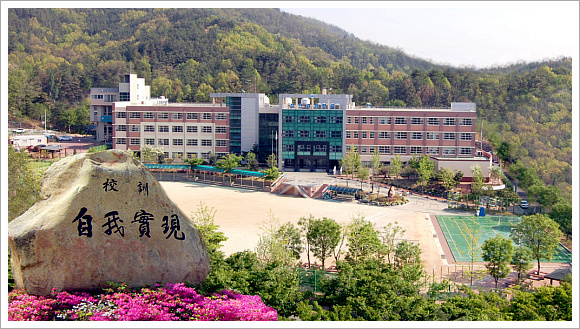 Like most Korean towns, Daegu is surrounded by mountains and in the far west of the city, the area of Song-so nestles against Waryong Mountain (와룡산). 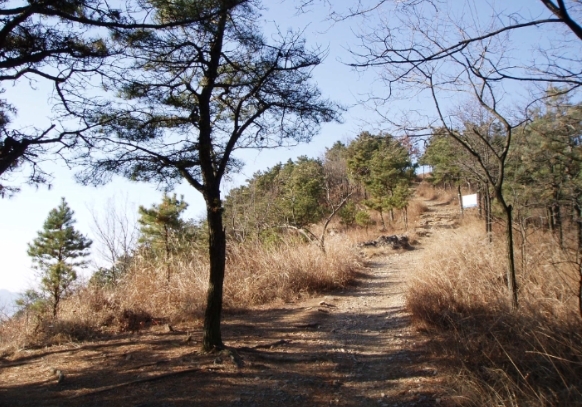 The mountain isn’t as high or rugged as Ap-san or the impressive Pal-gong Mountain and it is supposed to resemble a supine dragon, from which it takes its name. However, if you take a wrong turning, which basically means going off track, it’s easy to get temporarily lost and the thick, mostly pine forest and undergrowth mask the steepness of the mountainside. I once discovered this myself when I attempted to access the mountain from what I thought was a small footpath but which turned out to be a water gully. And, as the Song-so side of the mountain faces east, ancestral graves, with their solemn mounds and occasional stone markers, are common especially, where terrain is level. Somehow, the ‘Salamander Boys’ (도룡뇽 소년) didn’t work, it doesn’t in English and so they eventually became known as the ‘Frog Boys’ (개구리 소년). 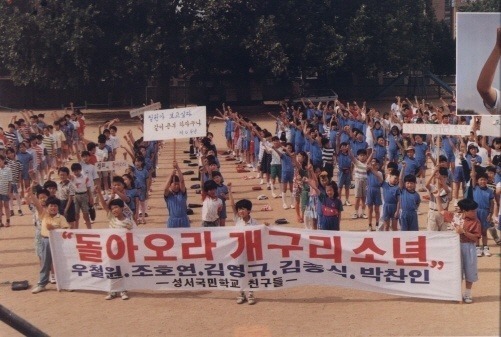 Their story, and the mystery which surrounds them is tragic and depressing and certainly in Song-so, where some of my students attend the same school (Song-so Elementary) which the five boys attended 20 years ago, they have not been forgotten. 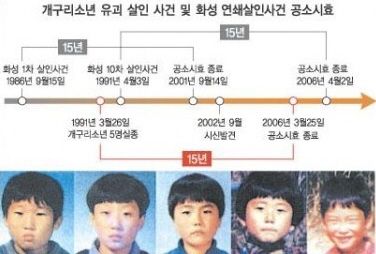 The efforts to find the Frog Boys, Kim Yung-wu (11) Kim Jong-sik (9), Pak Chan-in (10), Wu Chul-won (13) and Jo Ho-yun (12), galvanized the nation: over 300.000 police and troops searched the mountain, rivers and reservoirs and bus and railway stations were searched nationwide. Companies, groups and individuals donated 42 million won (about $35.000 dollars at the time) as a reward to those finding the boys. 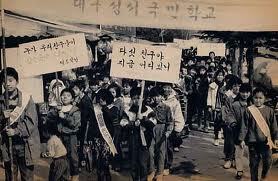 Local school children organized a ‘Find the Frog Children Campaign’ and milk cartons carried photographs of the boys. Devastated, many of the parents left their jobs to scour the country in the hope of finding them. 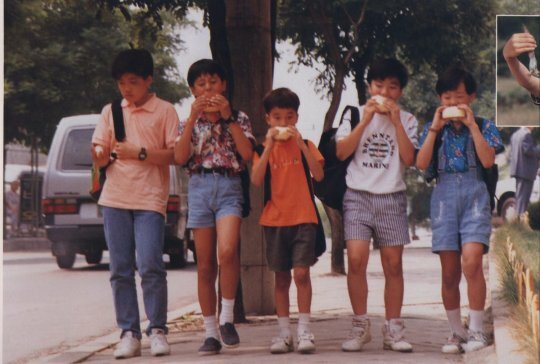 In 1992 a film was released called ‘Frog Boys‘. A year after their disappearance and no evidence of foul play, optimism lingered and many thought the boys had simply run away for an adventure. 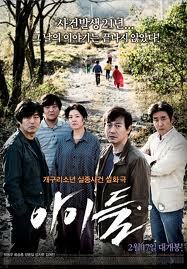 The film was intended to urge them to come home. 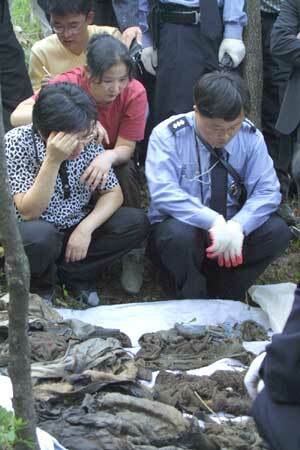 And though a special police investigation unit operated until 2001, there were neither leads nor clues. 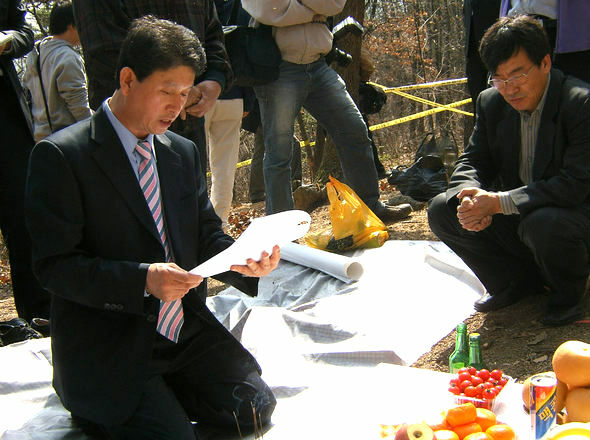 Speculation was intense with theories about kidnappings by North Korea, alien abductions, kidnapping by South Korean ‘authorities’ for medical science and even accusations levied at the parents claiming they must have killed and buried their sons. 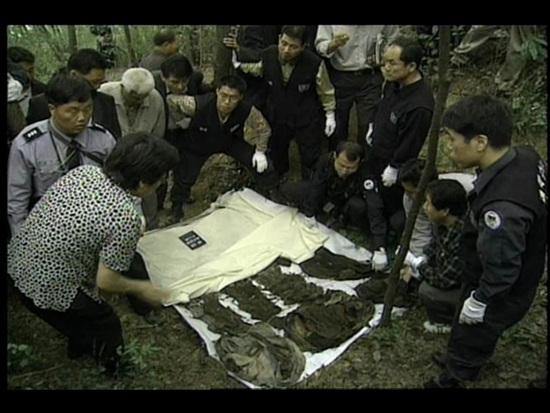 On September 26th 2002, a man picking acorns on the mountainside discovered pieces of clothing and bones and after eleven years the bodies of the boys were discovered. I remember these events well as I was living in Song-so at the time and for a few weeks developments were prime time news. The boys, their bodies entwined, seemed to have been huddled together and the police suggested they must have died from cold. However, they were only two kilometers from their homes and would have been able to see lights and hear traffic. The police claimed it wasn’t homicide despite the fact the boys’ skulls all had holes in them. Eventually, when ‘proper investigations’ had been conducted, though many argued the police and investigation team had been severely mismanaged and evidence damaged in the process, it appears homicide was almost a certainty. Shell casings had been found nearby, the boys had been tied and they appear to have been struck on their heads with some kind of implement which has not been properly identified. Moss growing inside the skulls suggested the boys had been hastily buried but as they lay in a gully, water eventually exposed their remains. In 2002, rumours were rife about the boys having been accidentally shot by hunters, or that stray bullets had struck one of them from a nearby military shooting area, now defunct, and subsequently had been murdered to hide what may have originally been an accident. It was suggested the weapon may have been a screw driver, but more disturbingly, because there are more than single marks on the skulls with a consistency of pattern, it has been suggested a tool for slaughtering animals in an abattoir may have been used. I remember one parent being interviewed on television; her son’s bedroom had not been disturbed since the day he disappeared. 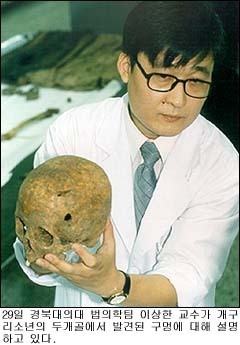 When a brace was found among the bones and bits of clothing, which would have belonged to twelve year old Jo Ho-yun, his mother said she couldn’t even recall if he wore a brace. I’m sure she could, but the memory probably too painful to envisage. Sometimes it’s easier to forget! As 2002 drew to a close, the police were speculating the murder was carried about by a mentally ill person or possibly by bullies from boys’ school. How you bury a body on terrain that even in wet weather is rock hard, suggests murder was planned or the perpetrator had time to go back down the mountain for the necessary tools. And the only rumour I’ve never encountered, and which would probably be the first to circulate in the west, was that they’d been sexually assaulted. 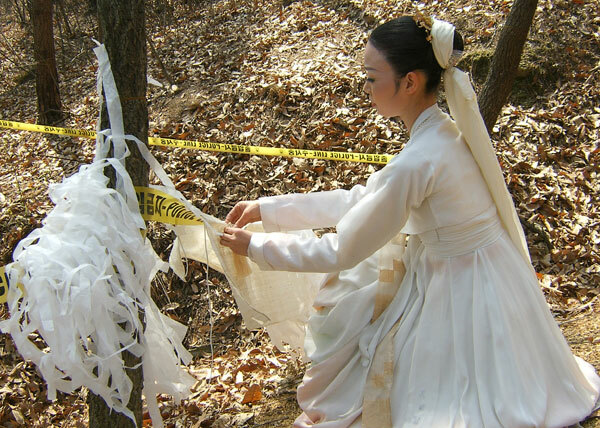 Despite the police promising to solve the case, now, almost another eleven years has passed and by Korean law, it would not be possible to try suspects. The case is now officially closed, and least in bureaucratic terms. 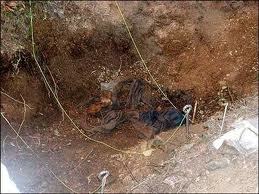 Shortly after their bodies were discovered, funeral services were held and rites conducted at the location where they were murdered. However, the boys’ skulls were donated to the forensic research laboratory of a university probably because the type of implement with which they were killed remains unknown. 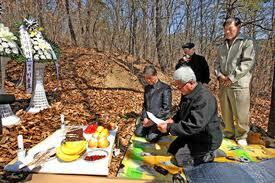 The boys’ school, Song-so Elementary (성서국민하교) continues to mark the anniversary of their murder with a solemn ceremony. 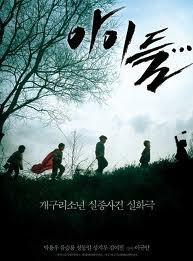 In February 2011, the film Children (아이들), was released recounting the events surrounding the Frog Boys, who would now be around 30 years of age. It is probably likely to remain one of this years most successful movies despite some criticism regarding its accuracy. Occasionally, when I look up at Waryong or walk through its forest, I think of the horrific secrets that lie hidden under the canopy of sturdy pines and knotted and gnarled oaks and in those moments the beauty of the mountain is disturbed by something dark, dreadful and ominous. I am fortunate, like most people Waryong is primarily a mountain and I can find beauty where a horrific crime was committed, but for those parents still living in Song-so, I would imagine Waryong, rising up like an enormous burial mound, casts a permanent shadow on their lives and has done for over 20 years. If there is any conciliation, it is that their sons finally, after 11 years, came down from the mountain and away from that ghastly gully where they murdered. Excellent post about local history that many of us otherwise would never have known. One can only hope that medical science has advanced greatly since then, though the statute of limitations part is depressing. Jake, thanks for your comments. I’ve been meaning to write this post for ages but knew doing so would depress me. Sad. Such a sad entry. Its a cliche in movies for a character to say that the dead are never really gone as long as someone remembers them. Well, now many people who would never have known will remember these boys. Thank you for this post. I saw the film Children and wanted to find out more about this terrible event, I really feel for the families of these poor boys. Yes, wheneverI’m in the mountain I am reminded of them. I just watched the movie last night. 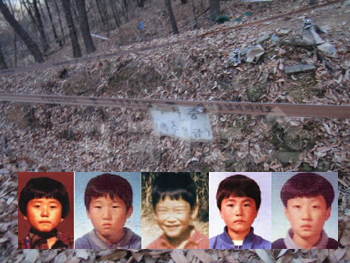 To know that the boys were tortured before they were murdered were indeed disturbing. May they rest in peace. 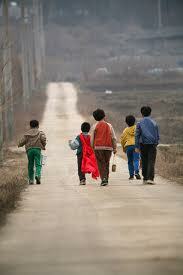 Any movie on children being murdered creates anguish and cry for justice deep in my heart. The monstrous predators escaped wheels of justice in this world but in the next they will atone and be punished for greatest sin there is taking the life of an innocent child. I cannot imagine the agony that these family have had to live with all these years wish I could ease their pain but all I can offer is a prayer of healing. I’m sorry. I pray for the souls of the children and to their parents as well. You’d think they might have had some markers or a small shrine there. 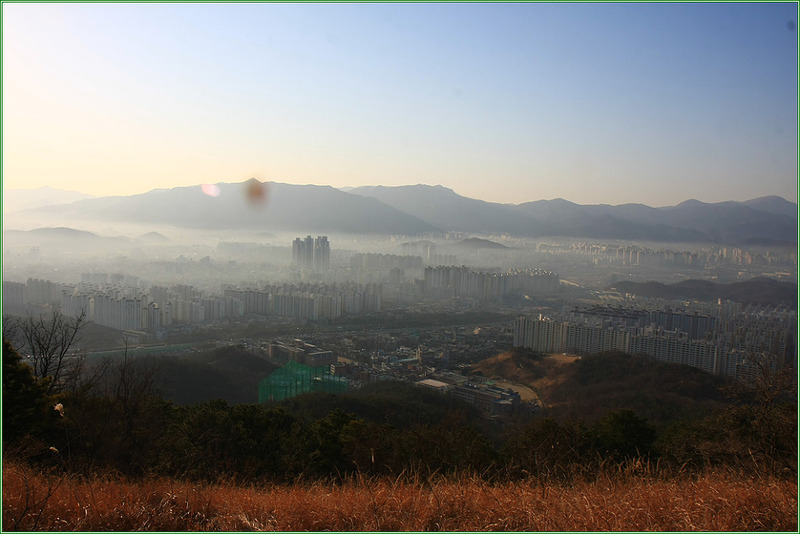 After looking at some more information on Korean websites upon my return to my Hotel in Busan, I noticed one picture which clearly shows the “site” as being closer to the bottom of the mountain than I was with what looks like a tallish brown building in the background. And probably like many other people here I have my own theories about this tragedy, I said a few prayers before I left anyway.